The human lumbar spine without muscles and viscera collapses easily. To allow movement, carry loads and protect the spinal cord and nerve roots “stability” is required. Stability is provided in a co-ordinated manner by the active (eg muscles), passive (eg lumbar spine) and control (eg neurological systems). There is controversy and some confusion on the definition of the term “core stability”. 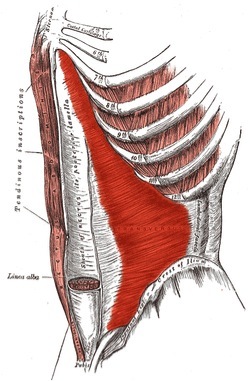 Traditionally this term has referred to the active component to the stabilizing system including deep/local muscles that provide segmental stability (eg transversus abdominis, lumbar multifidus) and/or the superficial/global muscles (eg rectus abdominis, erector spinae) that enable trunk movement/torque generation and also assist in stability in more physically demanding tasks. Different proponents have advocated different types of core stability exercises ranging from the abdominal drawing in maneuver (Figure 1) to sit ups or “plank” type exercises (Figure 2). Training the local muscles (developed by physiotherapists) is a complex skill for participant and trainer that requires precise and rigorous assessment, exercise instruction and feedback. Training the superficial muscles can be equally complex and is undertaken by a range of health and sporting professionals with a large variety approaches evident. An alternative term to “core stability” is “motor control” that reflects concepts around lumbar stability in a more holistic approach including: the brain, sensory inputs, motor outputs, mechanical properties of muscles/joints, what is normal/abnormal and what may be adaptive/maladaptive. Local musclesThe local/deep muscles have their origin or insertion on the lumbar vertebra therefore can exert a segmental stabilizing/stiffening effect. Standard texts provide detailed information on anatomy on key deep muscles and online resources are also available (see Figures 3-6). 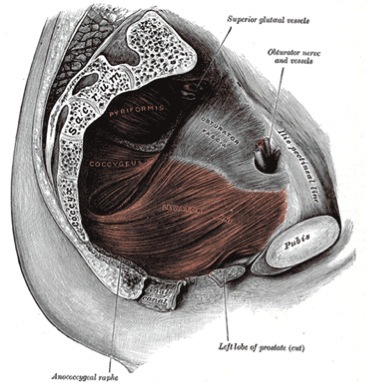 The mechanisms of the deep muscles and stability/stiffness are controversial but transverse abdominus may act like a canister with the diaphragm and pelvic floor muscles. 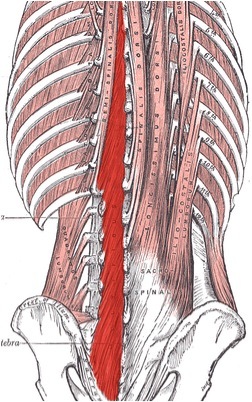 This co-contraction increases the intra-abdominal pressure, which creates an extension moment at the spine and has been hypothesized as increasing stability/stiffness in particular via connections with the thoraco-lumbar fascia. The multifidus may increase the rotational segmental stability in a sagittal and horizontal plan. Normal function of the deep muscle system is impaired with back pain. There is strong evidence supporting the effectiveness of treatment aimed at normalizing this function by way of “specific motor control training”/”specific muscle activation”. There are a wide range of superficial/global muscles that are large, cross multiple segments and do not attach directly to the vertebrae including rectus abdominis, external obliques and parts of the erector spinae. These muscles generate torque, act like guy ropes to control spinal orientation and work in co-contraction to control spinal motion in the application of external loads. The anatomy of these muscles is easily accessible online or in standard texts. Assessment of muscle function of the local/deep muscles is analogous with providing treatment. 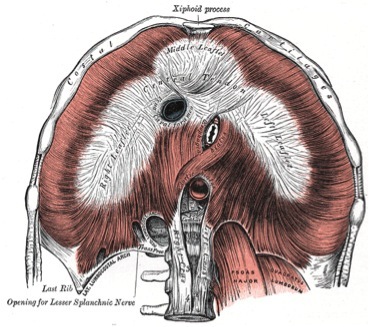 An understanding of a normal response is required for the abdominal drawing in maneuver (transversus abdominis), isometric activation of multifidus, normal breathing (diaphragm) and pelvic floor activation. Clinical methods have been published in texts, journals, and online (http://www.physio-pedia.com/Lumbar_Motor_Control_Training). The use of diagnostic ultrasound can also be of value as an adjunct to clinical methods. Here are some examples of exercises to improve the motor control / core stability of the lumbar spine. Clinical methods have been published in texts,  journals, and online (http://www.physio-pedia.com/Lumbar_Motor_Control_Training. Practitioners treating people with significant pathology where local muscle dysfunction is likely should retrain specific motor control before moving onto more global training. It is important for practitioners/sports personnel attempting to global/superficial muscle function and strength to have a clear understanding of any pathoanatomical problems that may be positively or negatively affected by such exercise. Ideally all of these exercises should be done with correct lumbo-pelvic posture and control of the local/deep muscles. With most of these exercises duration of hold and repetitions can be varied (depending on the aim of the retraining/strength program) provided the exercise is done with good control. Crunches- Lie supine on the floor with your knees bent, arms crossed over your chest and the feet flat on the floor. Then lift your schoulders from the ground and curl you stomach. Avoid a full sit up and ensure the low back remains in contact with the floor. See demonstration video below. Obliques crunches - As per a normal crunch but leading with one shoulder towards the opposite knee (alternate sides each repetition). Plank - Lie prone on the floor. Then while keeping your whole trunk straight (like a plank) lift up onto your forearms, with the elbows right under the shoulders, and toes. Hold this position as long as possible with control. To make the exercise more difficult try to lift one leg slightly of the ground. 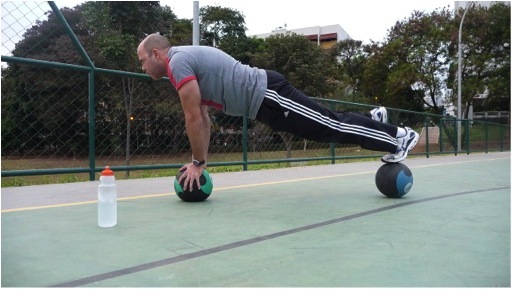 Balls/balance devices can also be used under the arms or feet. The plank can also be done on your side while supported by your feet and your forearm with your shoulder above your elbow. See video demonstration below. Bridges - Lie supine with your knees bent and the feet flat on the floor. Lift your pelvis of the ground while supporting on your feet and shoulders. The bridge can be progressed by lifting one foot off the ground end extending the knee. See video demonstration below. Hamstring raises - Balance on your hands and knees with your back flat and your arms/thighs perpendicular to the floor. Raise one leg behind you until it is horizontal. Alternate. See video demonstration below. Superman – As per a hamstring raise but progress by lifting the opposite arm to a horizontal position at the same time. Alternate. See video demonstration below. Leg raises - Lie on your back with your legs straight and your arms by your sides. Then lift one leg 4 inches of the ground. Your back has to stay flat on the floor. Don’t allow it to arch. Alternate. The exercise can be progressed by lifting both legs at the same time. See video demonstration below. Hundreds - Lie on your back with your legs straight and your arms by your sides. Then lift both legs so that they form a right angle in the hip and knees. Lift your arm straight a few inches off the ground. Then simply tap the ground 100 times. Focus on keeping your hips and legs completely still and your back flat. See video demonstration below. Leg extensions - Lie on your back with your legs straight and your arms by your sides. Then keeping the knee straight lift one leg until the foot is 4 inches off the ground. Alternate legs. See video demonstration below. There is no single muscle or single exercise for low back problems and motor control/core stability as a treatment. At a minimum practitioners/sports personnel should be aware of key concepts in motor control and exercise and follow an evidence-based approach to exercise prescription. Currently there is strong evidence for specific motor control/specific muscle activation in isolation, progressing to more global and functional exercises. ↑ 10. ↑ Lederman E.The myth of core stability.J Bodyw Mov Ther. 2010 Jan;14(1):84-98. doi: 10.1016/j.jbmt.2009.08.001.